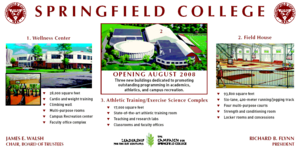 Springfield College is nearing completion on opening a multipurpose building with the goal of promoting excellence in academics, athletics, and campus recreation. This project consists of a 28,000 square foot wellness center, 93,800 square foot field house, and a 17,000 square foot athletic training complex. The Wellness Center will house a campus recreation center as well as a climbing wall, cardio/weight training, and faculty offices. The fieldhouse will have a six-lane, 400-meter jogging track, four multipurpose courts, a strength and conditioning room, and locker rooms and concessions. The athletic training complex will have teaching and research labs, classrooms and faculty offices, and a state-of-the-art athletic training room. This construction represents $45 million of private investment. Construction is expected to be completed by August 2008.